The Southeast Ranges are comprised of four sites located near Camp Edwards boundary with the town of Sandwich. They were developed for military training in the 1940s and were used from the 1950s to mid-1990s for a variety of defense contractor activities, including munitions testing and disposal. Most of the activity on these ranges occurred between the 1950s and the 1970s. 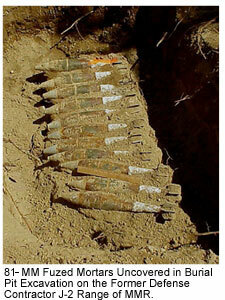 Defense contractor activities included open burning of explosives, disposal of wastewater, and disposals of munition items in burial pits. Training activities included conventional weapons training. This area is located at the top of the groundwater aquifer from which groundwater flows in a radial fashion. Groundwater Study Program investigation activities related to these ranges included archive searches, witness interviews, magnetometer surveys and geophysical surveys, as well as groundwater and soil sampling. To date, investigations have identified several areas of contamination associated with these ranges. The plumes vary in composition, but are generally a mixture of RDX, HMX and perchlorate. Three of the five identified areas of contamination currently have active treatment systems; a fourth is expected to become operational in the fall of 2008. The remedial investigation has included sampling of over 100 monitoring wells. Sampling results helped define two areas of contamination, the Northern J-1 plume, containing RDX and perchlorate, is migrating toward the impact area. The Southern J-1 plume, which contains RDX, is migrating into a residential area supplied by town water. A pump and treat system began addressing contamination from the J-1 South plume in October 2007, limiting off-post migration. The system consists of an extraction well, which withdraws groundwater at the rate of 75 gallons per minute and pumps it through a modular treatment unit that is located near the base boundary. Following treatment, an infiltration trench returns the treated water to the aquifer. By using an existing modular unit moved from another location, the entire system was able to be installed in less than six months. Potential source areas have been removed and treated. The remedial investigation/feasibility study report for the site was recently issued. Click here to access it. A Decision Document is available for this site. Click here for more information. To obtain a map of this area, click here. Two areas of groundwater contamination containing RDX and perchlorate have been defined. The J-2 North plume, which is now being treated, had the potential to impact a drinking water supply well. A cleanup system is reducing contamination and limiting migration of the J-2 North plume by treating 190 million gallons of groundwater per year. The J-2 East plume is migrating north from the southeastern end of the range. Contamination has not been found off base. Construction of a treatment system to address the J-2 East plume is underway. It is expected to be operational in the fall of 2008. 8,400 tons of soil were excavated from the J-2 Range in 2004, including source areas for the J-2 North and J-2 East plumes. Subsurface investigations being conducted to identify other potential source areas are removing additional soil contamination and metallic items. The Remedial Investigation/Feasibility Study Report has been issued for the J-2 Range. A Remedy Selection Plan which outlines the proposed cleanup alternative for the site has been issued. Click here for more information. An area of RDX and perchlorate contamination is migrating in groundwater to the south from the installation toward Snake Pond in Sandwich. Neither explosives nor perchlorate have been detected in Snake Pond. The source of the J-3 plume was part of a 3,500-ton soil removal in 2004. In September of 2006, a 175-gallon per minute pump and treat groundwater treatment system became operational. It is treating 92 million gallons a year. The Remedial Investigation/Feasibility Study Report has been issued for the J-3 Range. A Remedy Selection Plan, which outlines the proposed cleanup alternative for the site, has also been issued. Click here for more information. Small areas of groundwater, contaminated by RDX and perchlorate, are migrating to the southeast from the installation. Contaminant concentrations appear to be declining. Soil and groundwater sampling indicates the source area is depleted. The remedial investigation/feasibility study report was recently issued. Click here to access it.